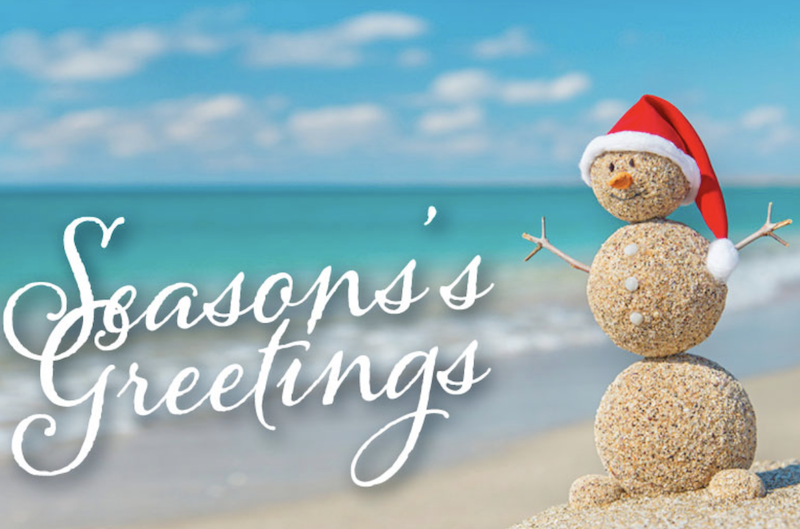 Wishing you and your family a wonderful festive season and a happy, healthy and prosperous 2019! We thank you for your continued support and look forward to assisting you with any of your future property needs. Please note: Our offices will be closed from 22nd December and will reopen on 7th January, however, we can be reached by phone and email during this time. Until then, stay safe and be merry! Across Sydney, Melbourne and Brisbane, there has been a significant drop in the number of properties scheduled for auction however, the spring market is seeing those numbers rise. The below data shows a drop in clearance rates of 11% in Sydney, 21% in Melbourne and 3% in Brisbane, for the October year on year comparison. October saw 2,706 properties scheduled for auction across Sydney, with an average clearance rate of 52%. Melbourne saw 4,612 properties scheduled, with an average clearance rate of 51%. Brisbane saw 501 properties scheduled for auction with an average clearance rate of 39%. In comparison, October last year had an average clearance rate of 63% (4,570 properties), 72% (5,974 properties), & 42% (1,390 properties) respectively. In September’s wrap up, we discussed understanding research data that reflects capital cities as a whole and how it is important to remember that each region within the city will perform differently. A recent article by David Ross, outlined the best and worst performing suburbs. The average September clearance rate for Sydney was 55%. Interestingly, Bondi recorded a clearance rate of 80.60%, while Kellyville only recorded 23.10%. This result demonstrates whilst the property market has slowed, properties in key locations with supply constraints are clearly outperforming the averages. Please see Australian’s best and worst performing suburbs over the September quarter below. Please also find full article in the link below. HOW WOULD LABOUR'S NEGATIVE GEARING STACK UP NOW? Maroubra is a beachside suburb located 10 kIlometres from the Sydney CBD. Its name originates from an Aboriginal word meaning 'like thunder', which is a reference to the surf conditions and the sound of the waves. In 2006, Maroubra Beach was the second Australian beach to be named a National Surfing Reserve (the first being Bells Beach in Victoria). Hereward Street takes its name from an event that took place in the late 1800s. A fully rigged iron ship known as the Hereward, weighing 1,513 tonnes, was caught by strong winds and shipwrecked at the northern end of the beach while en route to Newcastle. In 2013, a brass alloy canon was salvaged from the wreck and can be seen at Maroubra Seals Club, overlooking the site of the wreckage. 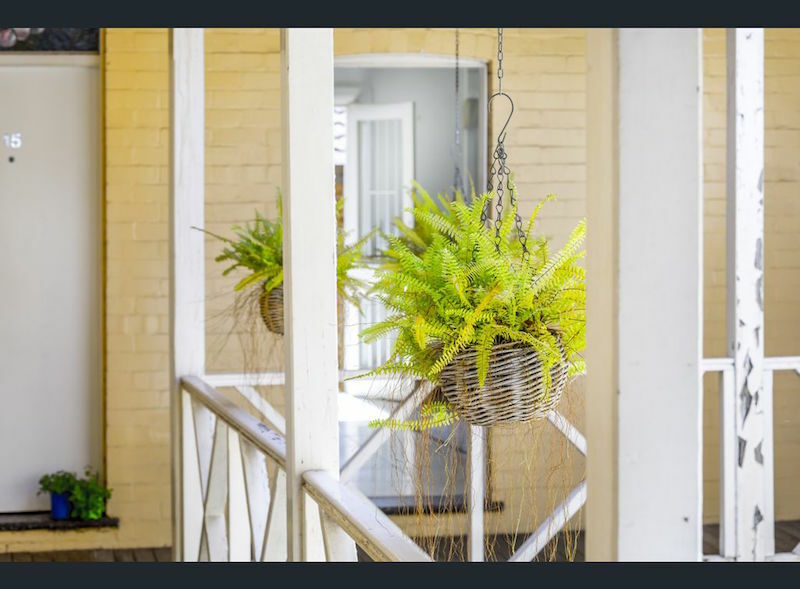 6/8 Hereward Street is a top floor, 50sqm apartment in a small art deco block of eight. 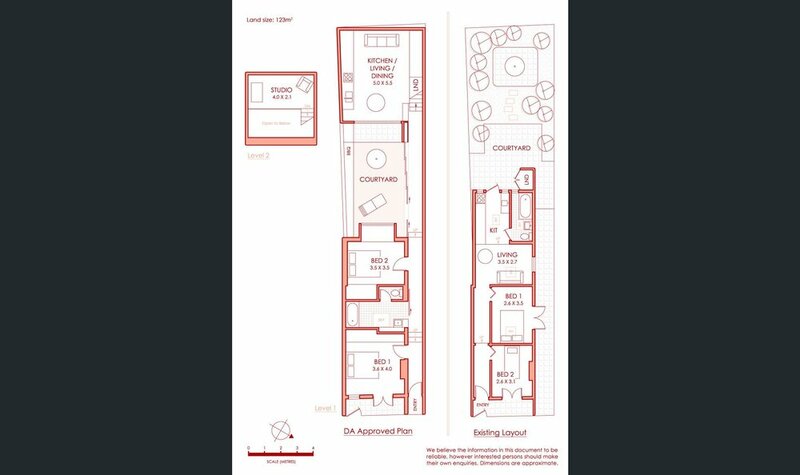 The floor plan provides open plan kitchen / living / dining, two bedrooms, bathroom and a shared laundry and entertaining garden. The apartment is north facing providing great light and is well presented in refurbished condition whilst maintaining its period charm. 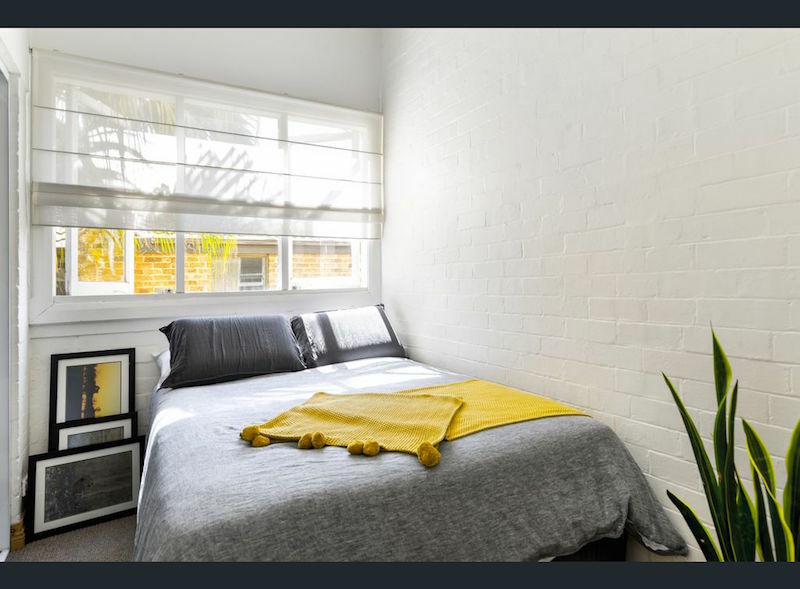 Located one block from the beach and walking distance to the shops and CBD bus stop, 6/8 Hereward Street provides a great opportunity for first home buyers and / or investors alike. Maroubra provides above average potential for capital growth while maintaining strong rental yields due to the suburb's proximity to the beach, CBD, RPA Hospital and UNSW. The price guide is $800,000. The rental guide is $600 per week, reflecting a gross yield of 3.9% at a purchase price of $800,000. Greetings from Scoutable and welcome to our August Wrap Up. Who's excited about spring?! August saw 2,204 properties scheduled for auction across Sydney, with an average clearance rate of 57%. Melbourne saw 3,104 properties scheduled, with an average clearance rate of 58%. Brisbane saw 411 properties scheduled for auction with an average clearance rate of 45%. In comparison, August last year had an average clearance rate of 70% (3,419 properties), 75% (4,212 properties), & 44% (1,059 properties) respectively. The above data is showing a drop in clearance rates of 13% in Sydney and 17% in Melbourne, while Brisbane is up 1%, for the August year on year comparison. Across the three cities, there has been a significant drop in the number of properties scheduled for auction. However, stock levels are up from last month and it will be interesting to see if clearance rates follow suit as we head into the spring market. Australian house prices have remained relatively flat this year and we have not seen the massive crash as predicted by some. It would seem the double-digit growth of previous years is firmly off the table. However, senior ANZ economists, Daniel Gradwell and Joanne Masters, are predicting property prices to rise in 2019. ANZ has forecast a total growth of 1.8% for Australian property for 2018, rising to 3.6% for 2019. “We think most of the slowdown has already occurred”. “We retain our view that prices will not materially decline". “Over the near term, auction results in Sydney and Melbourne suggest that the majority of the price growth adjustment is behind us.” Having initially predicted two RBA rate rises for 2018, the economists have pushed back their prediction to mid 2019 and suggest that this, combined with a strong labour market and rising incomes, will drive price growth. 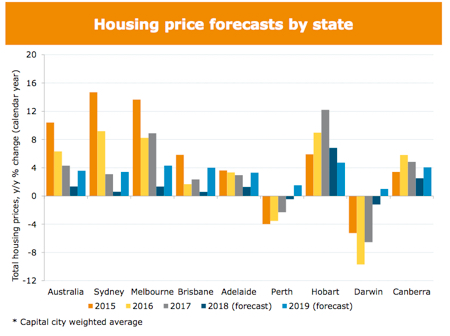 The graph is predicting Melbourne to outperform Sydney, with Brisbane not far behind. Hobart looks strong and it's great to see expectations for both Perth and Darwin back in positive territory for 2019. Whilst it would seem the RBA might not be making any movement with the official cash rate till next year, yesterday Westpac announced that they are increasing their interest rates by 0.19% effective September 19. It remains to be seen if the other major banks will follow suit. Even with households building a buffer in savings, movements in interest rates result in higher household debt which can have a negative impact on the property market. It will be interesting to note the effects of interest rate movements by the banks on the ANZ predictions over the coming months. 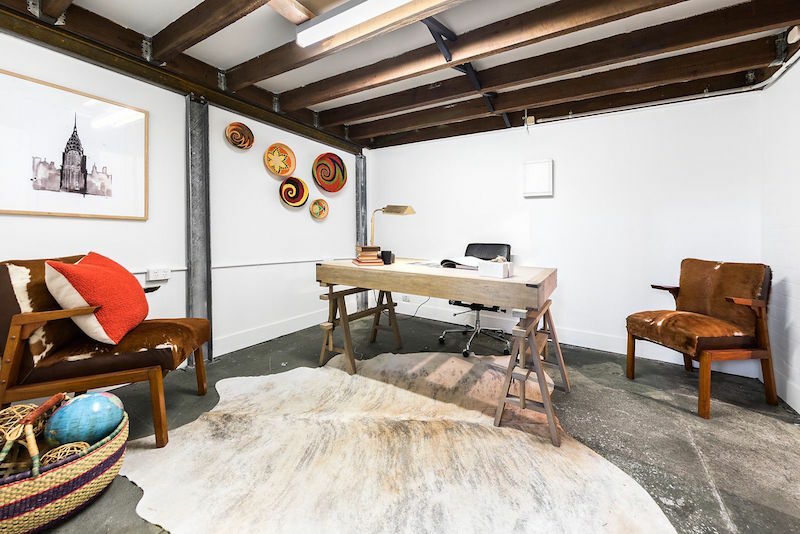 Woollahra is an Aboriginal word meaning camp, meeting ground or a sitting down place. 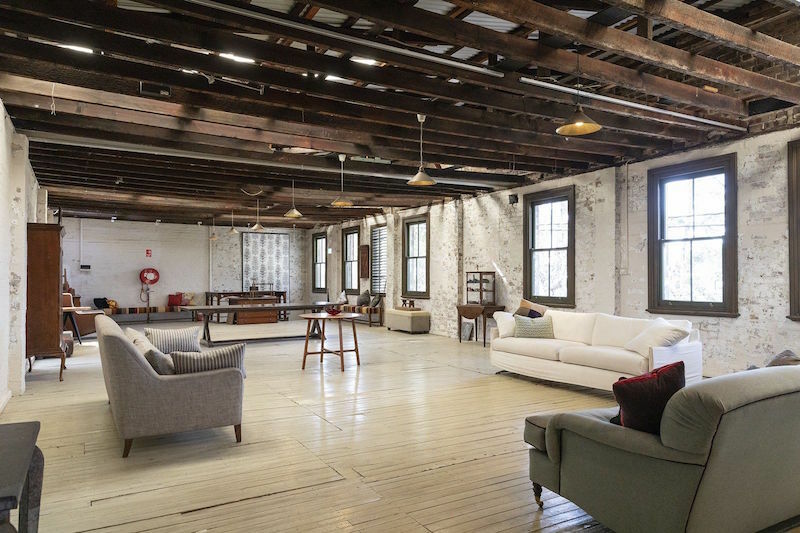 It's one of Sydney's more affluent suburbs with many heritage-listed sites, boutique shops, cafes, restaurants, and along with neighbouring Paddington, has the highest concentration of art galleries in Sydney. 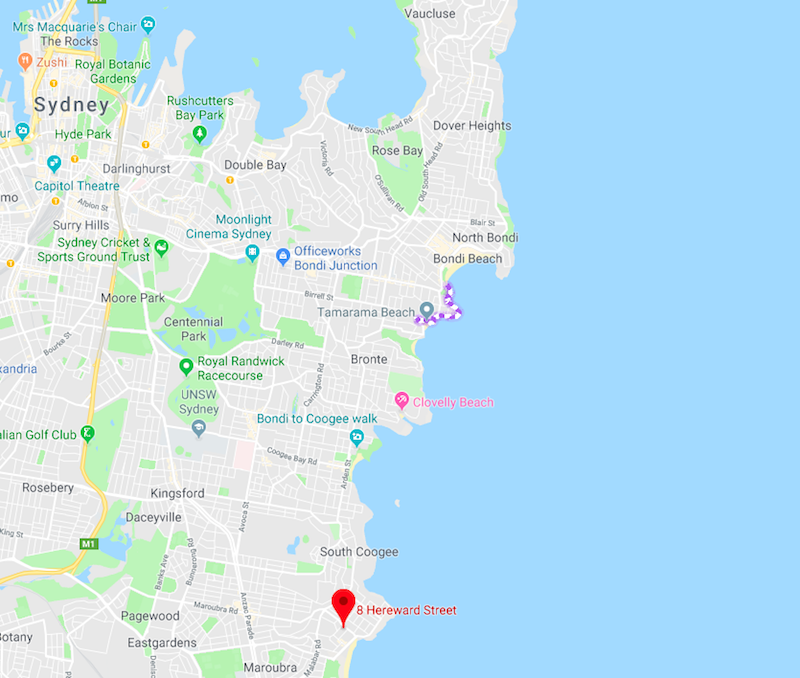 Set on a generous 340sqm of elevated land, and commanding northerly district views, 316 Edgecliff Road is conveniently located 750m from Bondi Junction Railway Station, 4km from the CBD and a short walk to local retail facilities. A four bedroom, three bathroom, freestanding home bursting with Victorian grandeur and charm, paired with the luxury of modern conveniences. All that should be cherished, has been, with well thought out additions. The layout comprises, ground floor formal living / dining, fourth king size bedroom, eat-in kitchen and powder room. The first floor provides accommodation for three more king size bedrooms, including the master bedroom with double walk in wardrobes and ensuite, and family bathroom. The property provides a front and rear garden, heated swimming pool and parking for two cars. The price guide is $5,000,000. Greetings from Scoutable and welcome to our May Wrap Up. May saw 3,018 properties scheduled for auction across Sydney, with an average clearance rate of 62.5%. Melbourne saw 4,387 properties scheduled, also with an average clearance rate of 62.5%. Brisbane saw 590 properties scheduled for auction with an average clearance rate of 43.5%. In comparison, May last year saw an average clearance rate of 74.3% (4,379 properties), 76.8% (4,922 properties), & 47.3% (1,195 properties) respectively. The above data is showing a drop in clearance rates of 11.8% in Sydney, 14.3% in Melbourne and 3.8% in Brisbane for the May year on year comparison. Across the three cities, there has been an overall drop in the number of properties scheduled for auction. While there is an obvious slowdown in the overall market, housing affordability is still a talking point. According to Peter Koulizos – Chairman of Property Investment Professionals of Australia(PIPA), many commentators are using just two indicators to measure housing affordability – income and house prices. "This is a good measure to indicate how expensive housing is, but if you want to analyse affordability, you must also consider mortgage repayments." In the table below, PIPA looks at the annual averages on loan size, interest rates, loan repayments and wages. Their research suggests that mortgages are more affordable today than they were in 1990. In 1990, it would require 48.1% of the average annual wage to pay off the average home loan of $66,300 due to the high variable interest rate of 17%. While the average home loan size has grown substantially to $389,000 in 2018, the standard variable rate is just 5.1% (or less) resulting in repayments of 40.9% of the average annual wage. While house prices are still rising in some blue chip areas it seems to be the initial deposit that is disabling buyers rather than the ability to service a loan and we’re seeing people using innovative strategies such as rentvesting or buying within syndicates. Once the Fitzroy Fire Station circa 1912, now 301 St Georges Road. Due to it’s mixed zoning, this Fitzroy North landmark had been cleverly converted into apartments and offices all whilst maintaining it's glorious façade. “Warehouse 1” is a three-level light filled home offering versatility and style, providing three well separated bedrooms plus two extra spaces ideal for the home office. Original fire truck doors lead into the garage which provides ladder access to the mezzanine office space. Unfortunately, while there is a ladder to climb up, there is no pole to slide down. Ground floor also has another entrance providing access to the second office, third bedroom and the rest of the home. 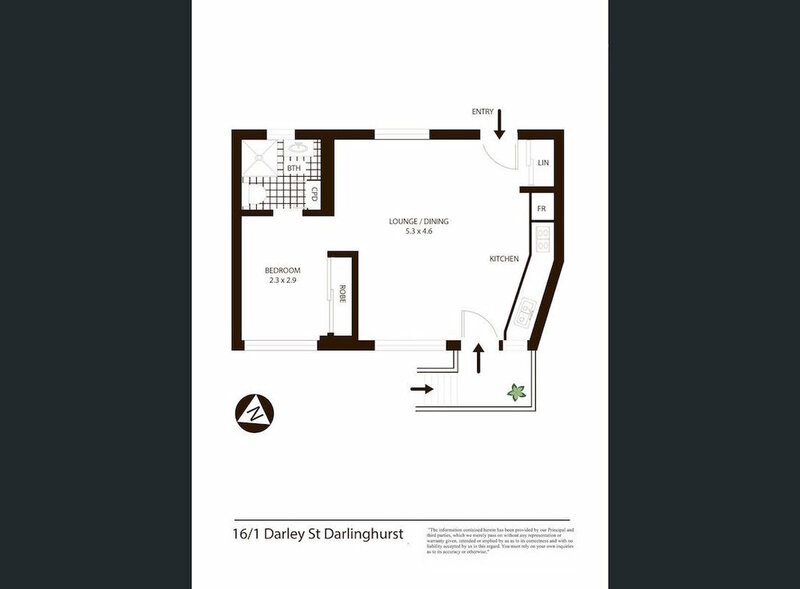 The first floor comprises the second bedroom, bathroom, balcony and an expansive open plan living space with exposed beam work providing clear zones for kitchen, living and dining. 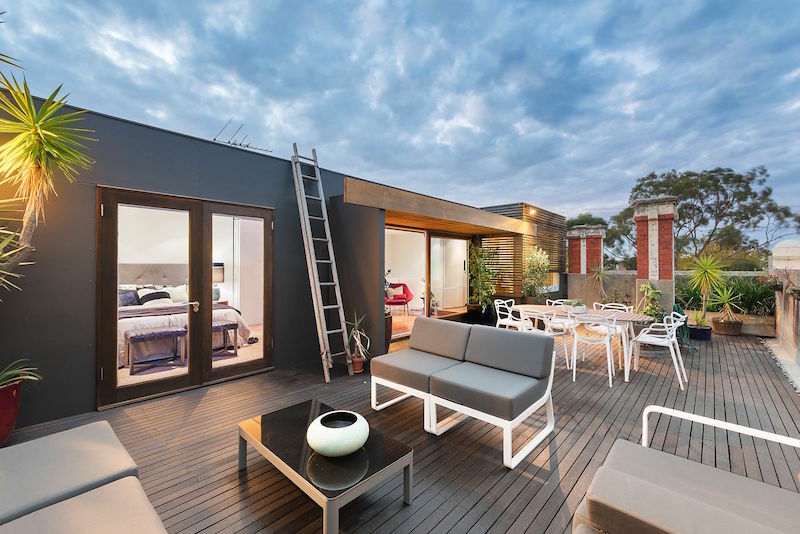 The top floor offers a master retreat with huge entertaining terrace and panoramic views to the city. With a guide of $1,850,000 - $2,000,000 we look forward to seeing what this one sells for. Greetings from Scoutable and welcome to our April Wrap Up. I hope you are well and enjoyed your weekend. With Easter behind us and the school holidays over, the market is back in swing with many new properties both on and off market. April saw 2,905 properties up for auction across Sydney, with an average clearance rate of 64%, Melbourne saw 3,825 properties, with an average clearance rate of 65%, and Brisbane saw 409 properties with an average clearance rate of 48%. In comparison, April last year saw an average clearance rate of 75% (3,122 properties), 78% (3,644 properties), & 47% (474 properties) respectively. The above data is showing a drop in clearance rates of 11% in Sydney & 13% in Melbourne for the April year on year comparison. Brisbane is showing a 1% increase. Across the three cities, there has been an overall drop in the number of properties scheduled for auction although the number of auctions scheduled is slightly skewed due to the fall of Easter in mid April 2017. Overall we're still finding the Australian property market patchy, however, properties in blue chip locations are still holding their value. As an investor, it is important to understand the costs of owning a property. An investment property has much the same initial costs as a property you purchase to live in (as reported in Scoutable's February Wrap Up), but there are a few ongoing costs you need to have on your radar. Better to be safe than sorry. You never know what's going to happen, so it’s advisable to have building and landlord insurance. No one wants red wine stained carpet or tenants who won’t pay rent. Generally this is paid annually and is levied on the owner of the land. If your property is positively geared, i.e. the total rental income is greater than the cost of owning and managing your property, the difference will be added to your taxable income. Council rates vary between councils and the type of property you own so it's important to keep it in mind when purchasing a property and to do your research. If you own a property within a complex, you will incur strata or company levies. Generally, this is to cover the building maintenance and up keep of common property such as gardens, lifts, pools etc. Occasionally, special levies may need to be raised for unforeseen building repairs or upgrades so it doesn't hurt to have a few grand put away in case this happens. The landlord always has to pay for water and/or sewerage services. You are also responsible for paying the water usage unless the property is individually metered in which case, the tenant can be charged. If you have someone managing your property, then you will need to consider the fees they charge for this service. Being an owner means you will need to put money towards maintaining the property and ensuring it remains in good condition. It's important to note that most of these costs can be claimed as a tax deduction and we recommend speaking with a tax professional regarding this. Some of our chosen properties focus on a savvy investment opportunity, others on architectural delights. This one comes from the busy bodies within who love to ogle over how the others live. It's the kind of place that gets you talking to strangers at the inspection. It's not the walls, but the art on the walls. Not the state of the kitchen but the vintage oven it encompasses. The parachutes and umbrellas, the hanging gardens and suspended windows. The birdcages. The paint. The multiple Persian rugs. Externally, this Alexandria warehouse appears as just that - a warehouse on a quiet suburban street. A ten metre frontage, single roller door and a couple of small barred windows are all that deceives you from the wonderland that is 311-313 Belmont Street. Step in side and you're transported to what feels like a museum or antique store. 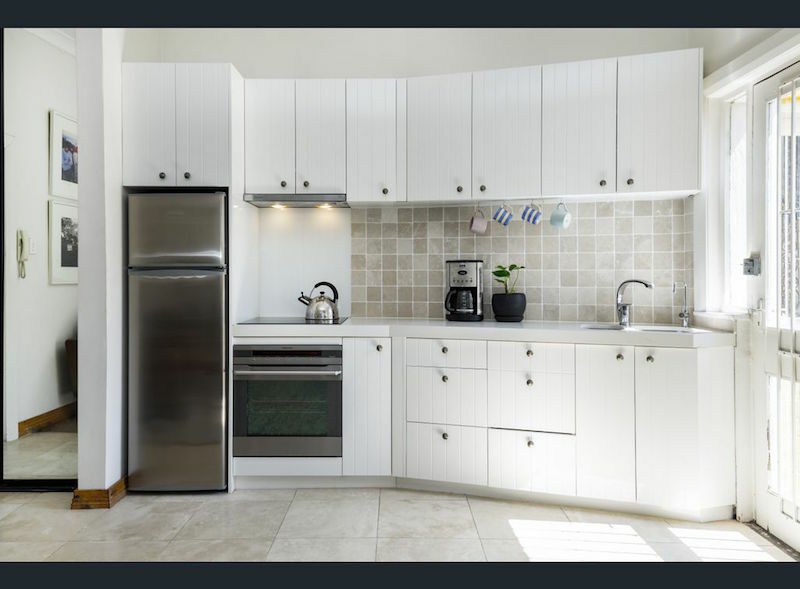 Set on 276sqm of land, it features front and rear roller door access, double lock up garage, kitchen, powder room, wet areas (bathroom and laundry), and a giant expanse of space with which the current owner has created a truly unique home, making clear definitions of living zones through out. Perhaps it's greatest feature is the possibility of what could be next, and with the opportunity to purchase the semi next door (309 Belmont Street), the options are endless. 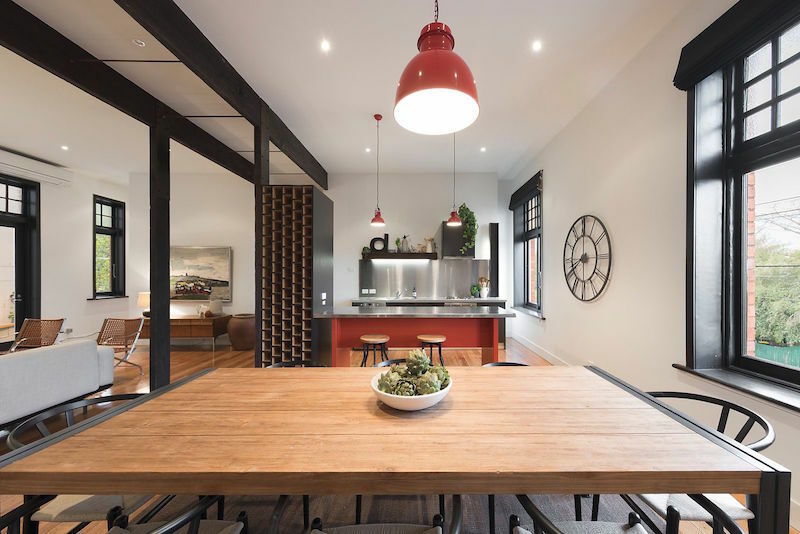 The warehouse comes with a price guide of $2.1m and the semi is looking to fetch $1.25m. Greetings from Scoutable and welcome to our March Wrap Up. I hope you enjoyed the long weekend relaxing with family and friends. The Easter long weekend brought a reduced number of properties up for auction last week. There were 362 properties listed for auction in Sydney, 148 in Melbourne and 57 in Brisbane, recording clearance rate of 78%, 70%, and 42% respectively. In comparison, the weekend prior saw 1,359 properties listed in Sydney, 2,078 in Melbourne and 194 in Brisbane, recording a clearance rate of 66%, 67%, & 49% respectively. The low clearance rates are impacting certain areas more than others. The inner city of Sydney and Melbourne are outperforming the greater capital cities. We are seeing some good competition for certain properties, some of which are selling significantly over the quoted price guide. Having said that, many believe it's a much fairer market with buyers and sellers able to engage in healthy negotiation. In a recent domain article, property analyst and head of SQM Research Louis Christopher explains the recent market downturn as a result of a regulatory "double-whammy" - APRA's crack down on interest-only loans and the federal government clamp on tax deductions and depreciations on investor property related expenses and items. Damien Cooley of Cooley Auctions has also suggested a lack of investor presence since the regulatory changes and that investors are looking to park their money elsewhere as there's not much short term gain on a two bedroom unit. While this might be the case, we always maintain that the property market is cyclic and we should be focusing on long term holds. The Reserve Bank of Australia, today at it's April meeting, decided to keep the official cash rate on hold at 1.5% for the twentieth consecutive month. Experts believe that it will not rise until some time next year. The March property of the month can be found in the little known Sydney eastern suburb of Eastlakes. 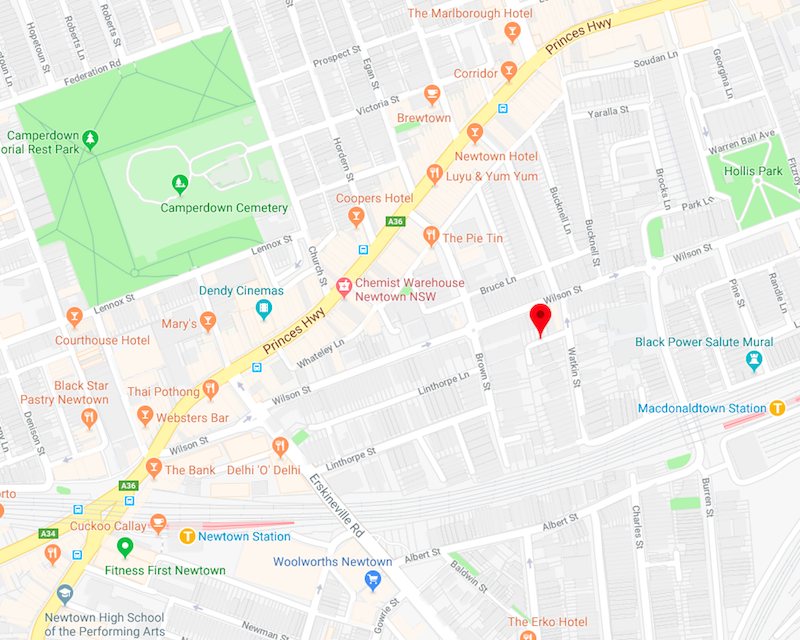 This quiet neighborhood nestled between Rosebery and Kingsford has been on out radar for a while now with the CBD, Sydney Airport, UNSW, Price of Wales Hospital and Maroubra Beach all under 10 kilometres away. The area is going through gentrification as many of the suburb's traditional Californian bungalows are owned by the Baby Boomer generation who are now downsizing. The area's revival is also linked to the improvement of retail facilities (Eastlakes Shopping Centre under major renovations) and CBD transport links. 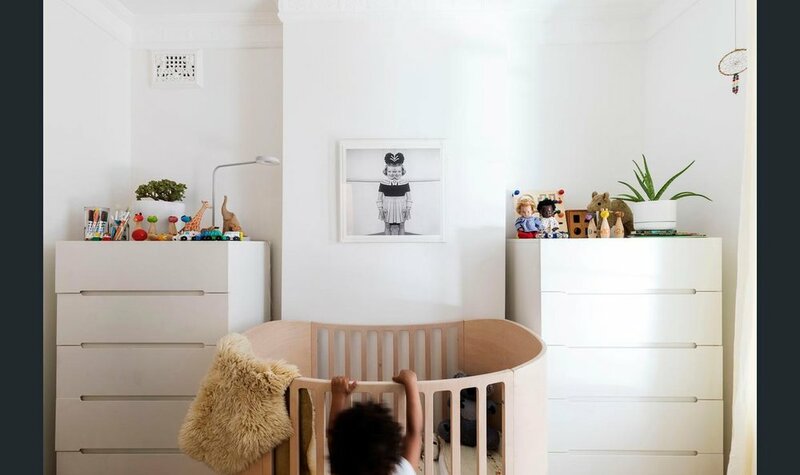 Eastlakes is catching the eye of young families wishing for more land without comprising access to the conveniences of city living. 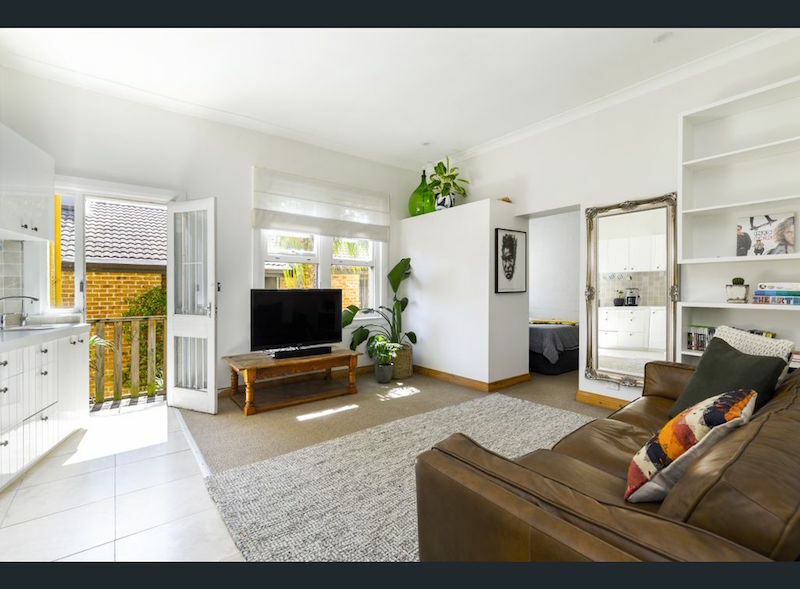 18 Lismore Street, is a perfect example of the type of stock available in Eastlakes. Sitting on a 450sqm level block of land this Californian Bungalow just sold for the first time in 48 years for $1,776,000. The property maintains all it's original charm featuring lead light windows, high ornate ceilings and picture rails. Providing three bedrooms, two bathrooms and parking for at least two cars, it has been kept in great condition and could be comfortably lived in with scope to improve in due course. 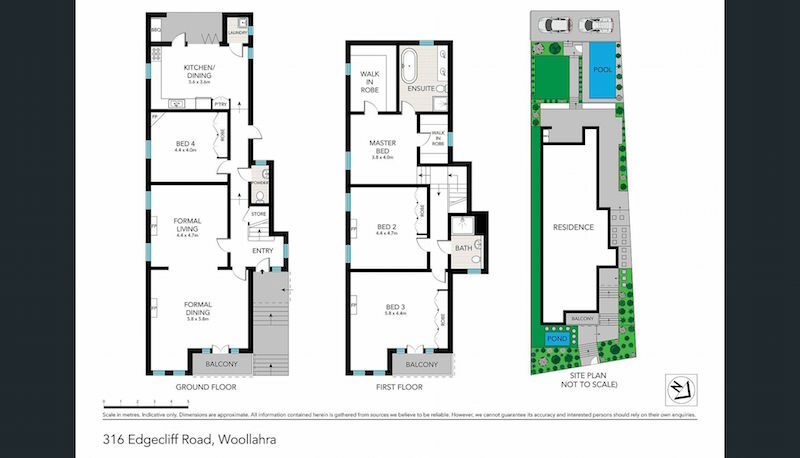 The abundance of land could allow for a granny flat, swimming pool or substantial veggie garden. The market is now in full swing and we're seeing plenty of good stock around. Last week, 3,313 auctions were held across the capital cities. A clearance rate of 66.8% was recorded which is higher than the previous weeks rate of 66.1% (of 1,992 auctions). For anyone thinking of buying, it's important to remember the various acquisition costs associated with purchasing a property as it's not just the price written on the contract. Most lenders will require you to pay LMI if your deposit is less than 20% of the purchase price and it is calculated based on your LVR (loan to value ratio). Basically, the larger your deposit, the less insurance you pay. Of course, if you have 20% or more, this is of no concern unless you are a foreign buyer as the requirements are stricter. When you take out a home loan, you will generally have to pay a fee to set up that loan. The fee varies between lenders but they are usually quite competitive. In some circumstances they can even waive this fee so make sure you ask! I would highly recommended using a solicitor or conveyancer to review and prepare all the documents for the contract of sale. Sure, there are some key points you can look over yourself if any of it makes sense to you, but it's imperative to have the documents reviewed professionally before proceeding with a property. The fees can vary based on the ownership structure and the amount of properties you have reviewed. Arghhh stamp duty! You've just got to pay it. There are various online calculators to give you an estimate on how much you must allow for this. The percentage you pay depends on the amount you spend and works on a sliding scale. Fortunately for some first home buyers, some states offer exemptions or concessions depending on the purchase price. There are also different rules for off-the-plan purchases and foreign investors. When purchasing a house, it's advisable to have a building and pest inspection carried out. In the case of buying an apartment, you would purchase a strata/company report which your solicitor or conveyancer will review. While it may seem like an unnecessary cost, it's definitely worth it and will be far cheaper than dealing with a pest problem or say concrete cancer further down the track. Building and pest inspections can cost around $500-$600 and strata reports generally cost no more than $300. Mortgage registration allows the mortgage to be viewed through a simple title search and prevents the mortgage holder from selling their home and not paying back the lender. When you take out a mortgage, the registration process will cost approximately $140 dollars in New South Wales as will the title transfer registration. This fee is to transfer the ownership status of a property and to register that information. Both these fees vary from state to state. Your solicitor or conveyancer will be able to advise on the exact amount. If the deposit is what you're lacking but you do qualify for a loan, paying LMI is still a good option and can be incorporated into your periodic loan repayments. If you're looking to buy a home or invest, let us help. We love property and would love to find the perfect one for you. 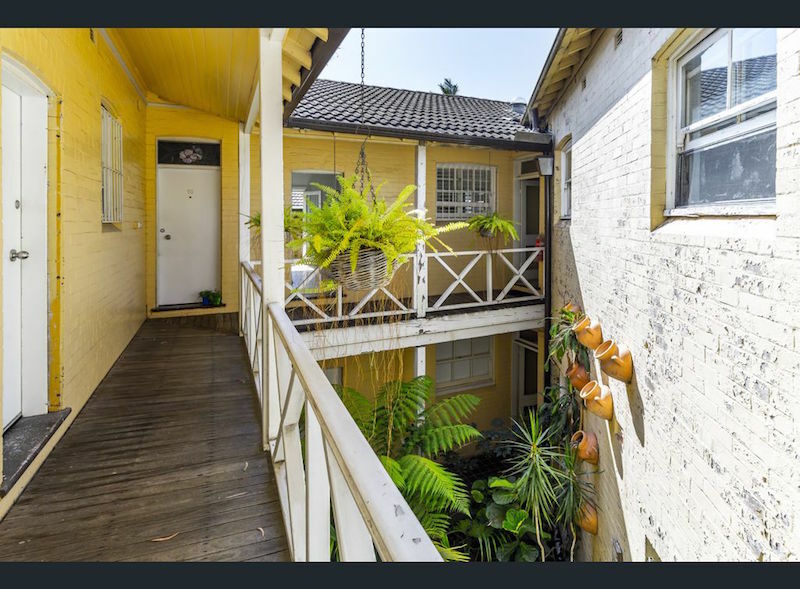 Recently sold at auction for $655,000 this studio apartment is a great first home or investor buy. 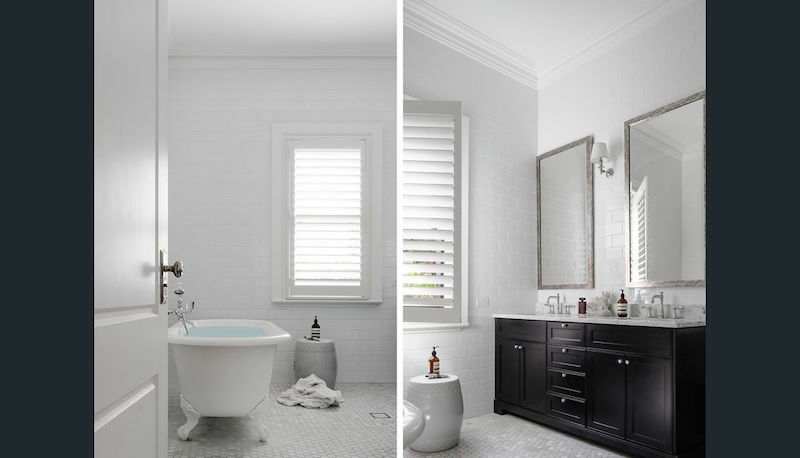 While it's only 39sqm, it's clever layout and 1930's charm give it a sense of space with potential to add value. 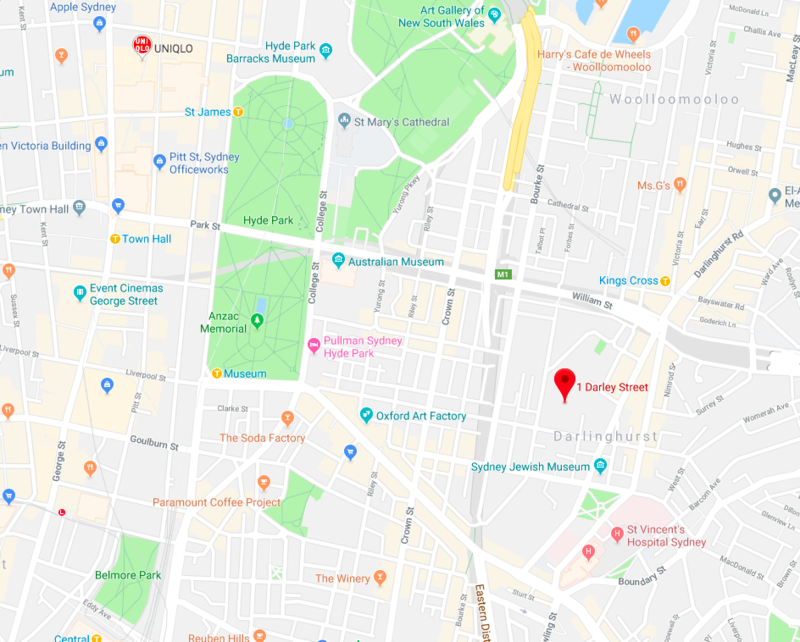 Positioned in the "Paris end" of Potts Point, it's located on a wide tree lined street, within walking distance to restaurant and retail facilities of Potts Point and Darlinghurst, St Vincent's Hospital, harbour parks, Kings Cross Station and the CBD. 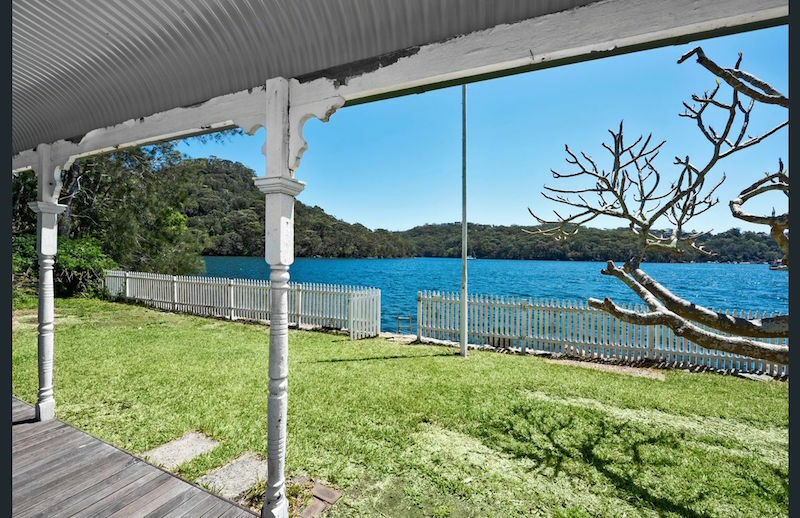 Properties like this provide a great opportunity to enter the Sydney market due to their enviable location and the high rental demand ensures they are hardly ever vacant.